The 11 pm forecast track for Hurricane Joaquin shows the tendency toward moving the track east is continuing, with the latest track now holding the center of the storm well off the East Coast as it travels north. This will result in less hurricane-based impacts from the storm in the Southeast. 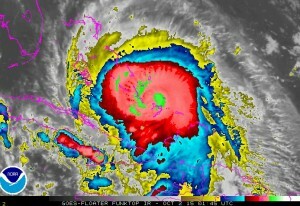 The 10:30 pm infrared NOAA satellite picture I grabbed from www.spaghettimodels.com shows a very mature storm. The “spokes” that you see around the center of the storm are a sign of convective instability and indicate that the storm is probably getting stronger, as they often do overnight. But the real story here is the heavy flooding which is expected separate from Joaquin due to extremely moist air, above normal sea surface temperatures, an upper level low and a stalled front in the area. The NWS office in Greenville-Spartanburg SC warns that this has the potential to be a life-threatening and historic flooding event in upstate SC, where some models predict almost 2 feet of rain over the next few days. The image below shows the 3-day forecast from one model, indicating a peak rain of just over 18 inches. Different models show slightly different timing and placement of the peak amount, but the general pattern is very consistent from one model to the next. A small change in the location of the heaviest rain could cause a big change in the amount of rain you get at your location due to the tight gradients, unless you are in an area well away from the center such as Florida, western Alabama and southern Georgia. If you are near the affected area, prepare for heavy flooding, power outages, and property damage due to falling trees. Don’t drive through water on roadways especially if it is moving. It’s probably safest to stay at home unless you live in a low-lying area, especially if it has flooded in the past. Get updates from the National Weather Service as conditions continue to evolve. Posted in Climate and Ag in the news, Interesting weather images, Tropical weather. Bookmark the permalink.